Businesses already know that local search engine marketing (SEM) is extremely powerful—a survey last year found it to be both the most widely used local digital tactic and the channel with the highest level of satisfaction. However, what many marketers don’t realize is that their local search marketing efforts could be even more effective. Businesses often use the same core set of local SEM approaches, such as targeting geographic keywords, and little else. By not exploring the full capability of SEM, and incorporating some lesser-used tactics, they’re missing out on huge opportunities to boost engagement. In particular, the four underutilized strategies below are simple, proven ways to reach a more qualified audience and significantly improve the effectiveness of local SEM spend. 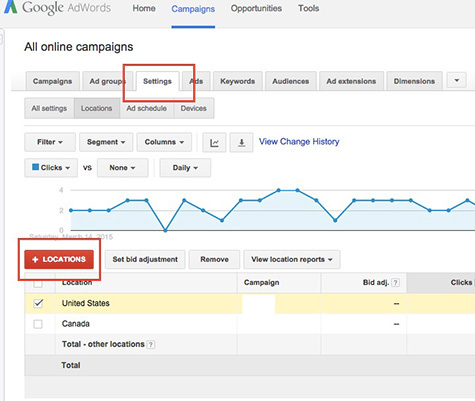 What: Most advertisers are aware that Google AdWords can be targeted by location. However, what is sometimes overlooked is the opportunity to utilize geographic bid modification within the same campaign. In other words, you do not need to create a new campaign for each location you’re targeting—instead, you can target a single campaign to a set of important places to your business. This approach allows you to bid higher or lower by individual location—meaning that you can pay more or less for the same campaign based on the value of consumers in different areas. 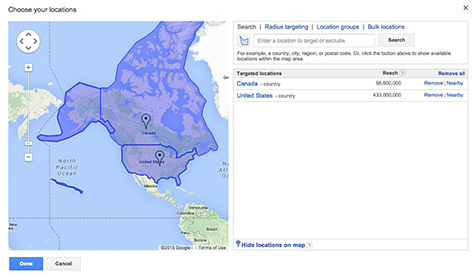 Why: The advantages of geo-targeting a campaign cannot be overstated. Putting your search ads in front of likely purchasers in the right places—whether that be a particular country, state, town, or even postal code—can have a profound impact on engagement and campaign profitability. For example, this test of geographical targeting by WordStream led to a 58% jump in conversions, 13% boost in CTR, and a 27% drop in cost per conversion. From there, you can add places by name, postal code, or even map location. Within each target you can then adjust the bid (i.e., say you’re willing to pay a higher or lower maximum amount for users in that locations). What: For business that rely on easy accessibility by phone—such as local services—Google’s call extension for search ads is extremely useful. To maximize performance, try selecting mobile as the device preference. Why: If you don’t specify your device preference, Google’s call extension also displays on desktop computers. That’s not terrible, but these campaigns really shine on mobile devices, where phone dialing is a natural behavior. By selecting the mobile device preference you can significantly increase direct call volume to your local business. How: First, start by establishing a dedicated “call only” campaign, and enable call extensions for it (this YouTube video is a good primer for getting started). Next, within the campaign manager navigate to “Ad Extensions,” then “Edit,” then “Change device targeting.” From there, you’ll be able to select mobile devices. In other words, because it knows both a user’s current behavior (searching for something) and previous actions (visiting certain websites), Google is able to deliver highly relevant ads at likely times to purchase. This can be done based on niche keywords—such as reaching out to previous visitors when they search for relevant phrases to your business—or more subtly (targeting broader terms like “gift,” etc.). 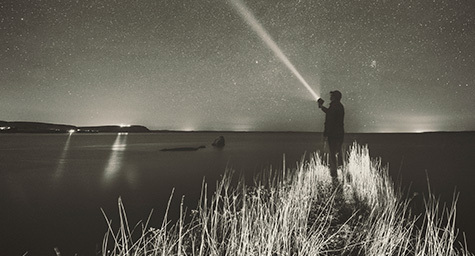 Why: The simple idea of targeting search ads to previous site visitors is incredibly valuable. By pairing search ads based on keywords with a high likelihood to purchase, you can significantly boost the effectiveness of your search ads. How: Starting a remarketing list takes a bit of effort—you have to add a remarketing tag to your site—but things are pretty easy from there. 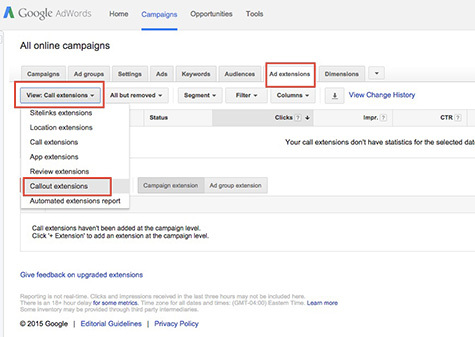 Once your tag is added and the list is set up, simply go to the “Audiences” tab in your campaign manager, then “+Remarketing” (this Help Center article gives a good overview of the full workflow). What: The callout extension allows you to add extra text to a search ad (such as the “Free shipping • 24-7 customer service • Price matching” in the ad below); this text is not clickable, but it provides extra context and is an opportunity to include hyper-local language. Why: The callout extension is a no-brainer for local businesses. With the extra ad real estate you can include specific geographic words (locations, events, teams, etc.) at no additional cost. This hyper-local language can hook local consumers and help you stand out from the crowd. How: You can find a full callouts guide here. Basically the extension works like most of Google’s other offerings. 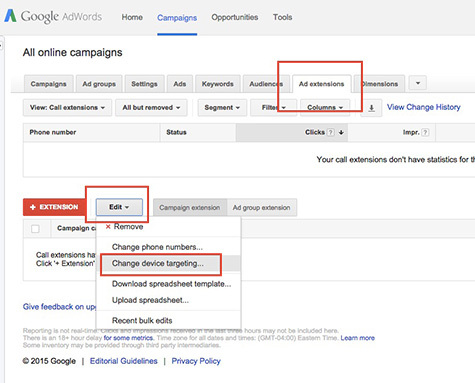 Start in your campaign manager and navigate to “Ad extensions,” then “View: extensions,” then “Callout extensions.” From there you’ll be able to craft your language for each campaign. As with the call extension, we recommend creating a separate campaign for each callout extension so that you can properly craft your local language.